Call for current price. 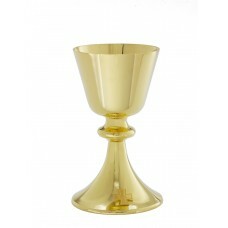 24kt goldplated chalice comes with a paten. Chalice features a beautifu..
Chalice Ht. 6 7/8". 14 oz. with 6 1/8" bowl paten. Call for current price. 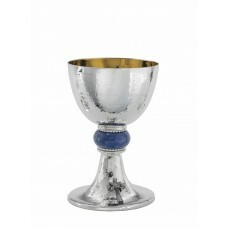 Silverplated Chalice with Bowl Paten Hammer textured chalice and bowl pa..
Chalice Ht. 6" 14 oz. with 6 1/8" bowl paten. Call for current price. 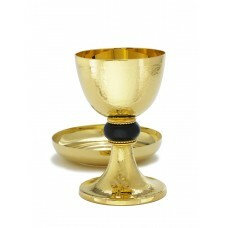 Items are 24 kt Gold Plate - Engraving Available - All Host Capacities are b..
Chalice Ht. 7 1/2" 11 oz. with 5" scale paten. Call for current price. 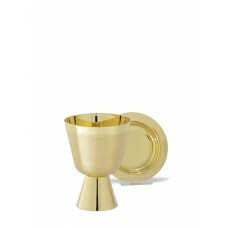 24kt goldplated chalice and paten. 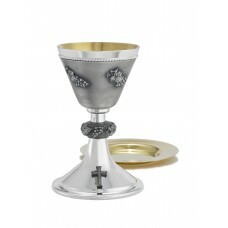 Chalice features a cross on the base. ..
Chalice Ht. 7 1/2" 14 oz. with 5" scale paten. Call for current price. 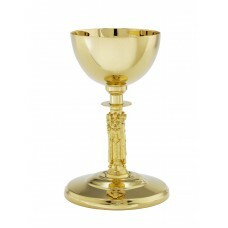 24 kt goldplated chalice and paten. 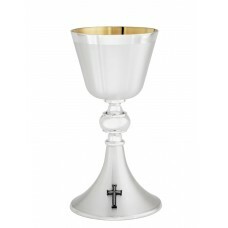 Chalice features a cross on the base. ..
Chalice Ht. 7 1/8" 12 oz. with 5 ½" scale paten. Call for current price. 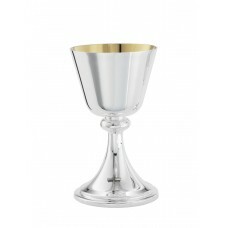 Silverplated brass chalice with 24kt goldlined interior. 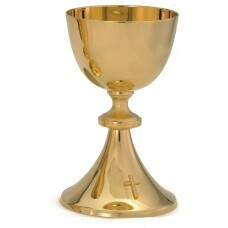 Chalice comes with ..
Chalice Ht. 7 3/4" 12 oz. with 5 1/2" scale paten. Chalice Ht. 7 7/8" 11 oz. with 5 1/2" scale paten. Call for current price. 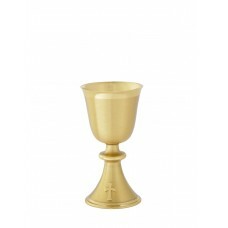 24kt goldplated chalice and paten. 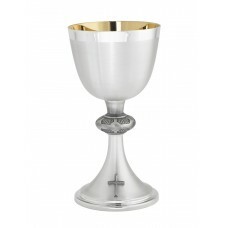 Chalice features a Celtic cross on t..
Chalice Ht. 7 7/8" 14 oz. with 5 1/2" scale paten. Call for current price. 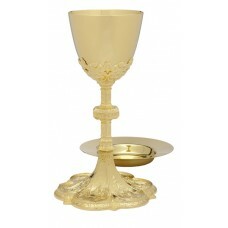 24kt goldplated chalice and paten. Chalice features a beautiful Holy Family ..
Chalice Ht. 7" 8 oz. with 5 3/8" well paten. Call for Current price. 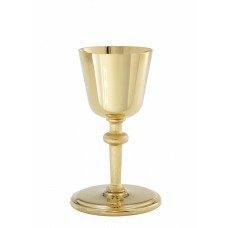 Silverplated chalice with 24kt gold-lined interior. Brite-star anti-tarnish ..
Chalice Ht. 8 1/4" 14 oz. with 5 1/2" scale paten. Call for Current Price. 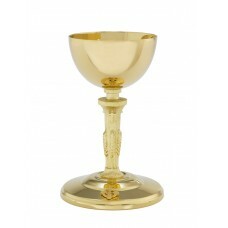 24kt goldplated chalice and paten. Chalice features unique wheat design on t..
Chalice Ht. 8 3/8" 16 oz. with 5 1/2" scale paten. Chalice Ht. 8 5/8" 12 oz. with 5 1/2" scale paten. Chalice Ht. 4 1/8" 5 oz. with 3 1/4" paten. Call for Current Price. Made of high polish 24kt goldplate with silver oxidized base. Great for trav..
Chalice Ht. 5 1/2" 5 oz. with 3 1/4" paten. Call for Current Price. Made of high polish 24kt goldplate. 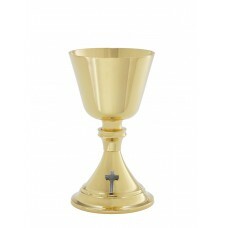 Chalice features a cross on the base. D..